To be honest this was a difficult report to write. While I am grateful to have participated and finished the Ironman Oceanside 70.3 event it was a bitter-sweet experience. It was a disappointing race performance for me, far below my potential. It is simply something I didn’t want to re-live through a race report, but if I was going to learn from it and maybe hope to help somebody else through my experiences I thought I had better do it. The trip was planned as a family vacation for us because it happened to be at the end of spring break when my kids and husband were out of school. My husband is a teacher. So we ended up driving from Northern Utah to California a week early. I secured a hotel close to the transition area so I could walk to the start and wouldn’t have to disturb my sleeping family or need to have my husband drop me off on race day. I could also get more familiar with the run route since I had not done this race before. 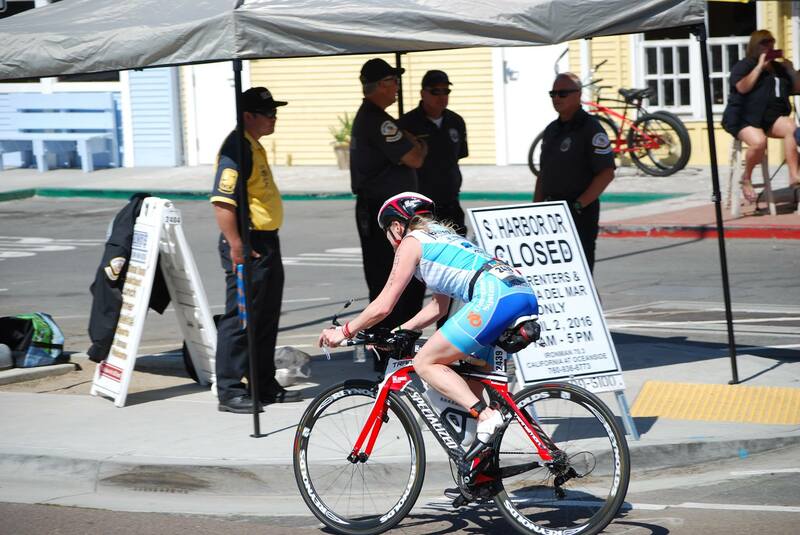 Unfortunately the cycling route traveled through Camp Pendleton and was off-limits and we were not allowed to ride it before the event as I usually like to do before races. I did know it was a hilly and challenging bike course in which I was prepared for. 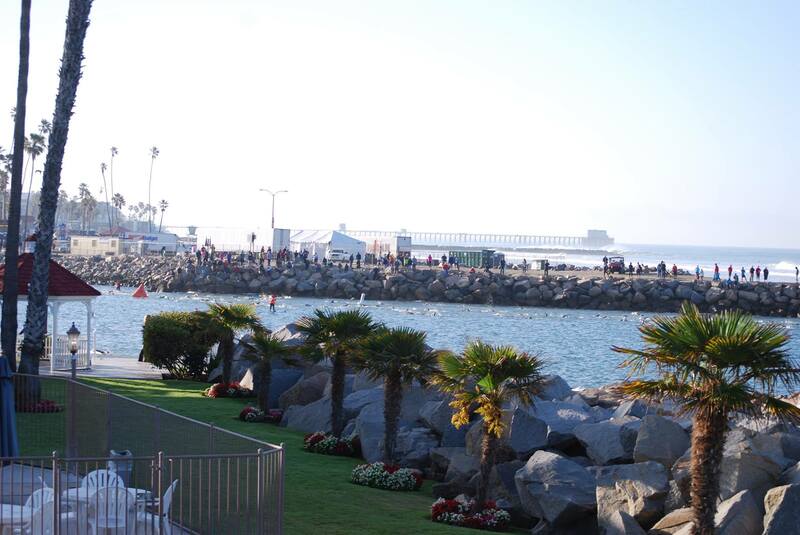 I was hoping to get a few open water swims in before the event but I learned that swimming in the harbor was also not allowed until the race day and swimming in the Ocean by myself was too risky, so my first open water swim of the season would have to be in the race. We had a fun-filled and relaxing week and I was able to get out on some runs and rides. Since we were there early I hit packet-pick-up on Thursday to avoid the crowds (I am not a fan of waiting in long lines). 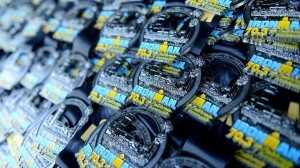 I visited Ironman village and browsed the booths briefly and bumped into a few friends. It was fun to see where the finish-line was and get excited about participating in just a few short days. I was careful to limit my sun exposure during the week and really took it easy to make sure my legs were fresh for the race. I have been looking forward to this race all winter and was very excited to do it and have my family there. The morning started with cool temperatures at 46 degrees at 5 a.m. It was expected to warm-up, be sunny and reach the high 60’s before the end of the day, so I lathered on the sunscreen. The water temperature was a cold, 62 degrees, similar to Ironman Maryland I did last October. I choose to wear my sleeveless wetsuit again since it’s better for my damaged shoulder and I am used to cold open water swimming coming from the mountains were our water is melting snow run-off. After saying hello to some friends and setting up my transition area, I suited up. I also met another friend, chatted for a minutes and then we headed to our wave start corral. As we made our way up we were able to see the pro’s finish their swim and run into transition. What a thrill it was to see the determination and focus on their faces! As we entered the water and swam over to the start, we were only there briefly before the race began. No sooner did I hit my Garmin 920xt watch to start my swim time than it was struck by another athlete and I heard an audible beep and felt a vibration from my watch, which indicated that my watch was stopped or would be tracking a transition time. This means I may not know what my swim time is coming out of the water or have GPS on it. Since I am a time-goal oriented person I was not happy about this. But I put my head down and swam. I am a fairly strong swimmer, not elite or anything, but strong enough and the first part of the race went pretty smooth. It was as usual with people all over and you just swim while everyone is hitting everyone. My mindset was good and I pushed through. The yellow sight buoys were nice since they were fairly close, so it was pretty easy to see where to go. The course was a narrow “horse-shoe” out-and back type route. I could tell as we moved our way out we were getting close to the mouth of the harbor as the water became choppy. On occasion a swell would rise and I would catch it in my mouth and take a hard swallow of very salty ocean water. Every time this happened I kept telling myself not to swallow the water but it seemed like an automatic reflex. At this point in the race I started catching the slower swimmers from the previous wave that started 3 minutes before us. As I sighted I could see many different color caps, so some faster swimmers from the wave behind us were also starting to catch us. It brought back memories of 2012 AG Nationals where I got hit hard in the back of the head and was nearly knocked out suffering my first concussion. At this point I just wanted to avoid people, which is impossible in a large race like this. I also had a headache. It was getting congested to say the least and people were everywhere jockeying for position! Some were swimming fast over people, others swimming slow doing the backstroke and some were completely stopped. I just tried to move forward and swim around people. Sometimes a swell of water would come up just as I was taking a breath and I would swallow a mouth full of salty water, again. As we turned the final buoy to swim the stretch back, the sun was in my eyes. I could not see the next buoy and the swells were getting bigger. It was hard to know which way to go and the continued congestion didn’t help as people were spread wide. So I stopped to see if I could get my bearings. 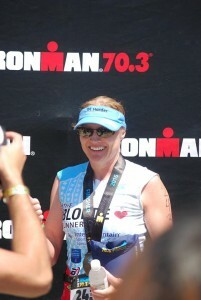 I didn’t want to swim extra as I did at Ironman Maryland and it cost me a lot of time. With my shoulder it is really hard for me to swim straight so I have to sight a lot. No luck, the bright sun just made it difficult to see, so I just swam with the crowd and stopped on occasion to see if I could figure out if I was going straight. It seemed to take forever to get the finish dock and I felt a little like a pinball going right until I hit someone and then going left until I was blocked by someone else. Every time I lifted my head up I could feel my head pounding. I had a massive headache by now. I found it hard to get into a rhythm and my timing was off for breathing, resulting in drinking more salt water! I have no doubt I swam a ton extra despite my efforts to sight frequently (since my watch was hit and was not on GPS anymore I will never know how far I actually swam because I can’t analyze my swim data which drives me nuts. I know the first part of my swim was good, but wanted to see just how much extra I swam). With the headache I thought, “Oh, no – not already!” I have dealt with headaches a lot over the last year because of a concussion I suffered as a result of being hit by a truck on my bike so I knew it was going to be a long day but the thought of pulling-out never crossed my mind. I am not a quitter and am a strong swimmer even though the numbers don’t reflect this. 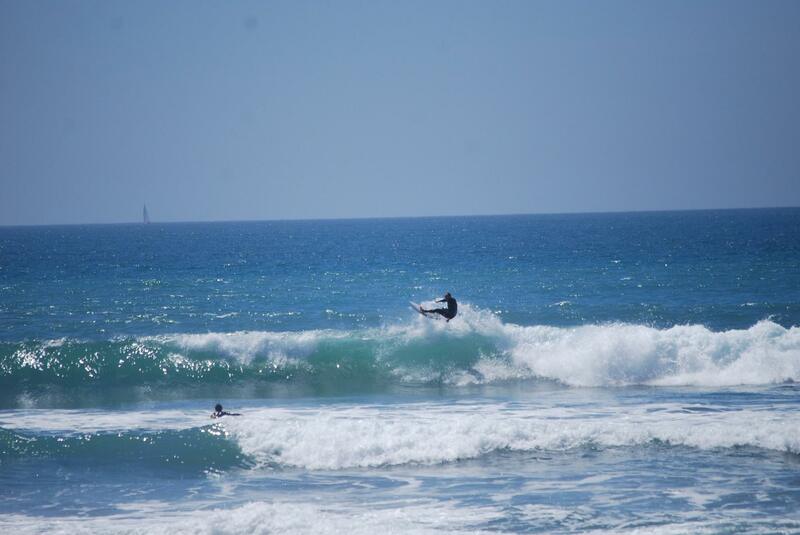 I clearly became too anxious with crowds, swells and the sun in my eyes. It throws my timing off. As I exited the water and looked at my watch my suspicions were realized. My watch was hit and I was in transition mode. Not only did I not know my swim time but I would need to get the watch into cycling mode so I could see watts on the bike. As I made my way to my transition, I slowly changing my watch mode to be ready to ride, I asked a spectator the time and they said 8:05. I thought, “Oh, crap! That is slower than I thought.” I knew my swim would be slow but considering my wave started at 7:23, this was VERY slow. I had planned to be on my bike by 8 a.m. Wow, I had a lot of time to make up and with a pounding headache that was a tall order. As I started the ride it was congested once again with lots of people around. There were many turns and a quick steep climb before we entered Camp Pendleton. It’s on a turn so can sneak up on you, but I had done my homework and made sure I was in the right gear and was on my way to complete the 56 mile one-loop route. Almost immediate on the bike in aero position my nose began to drip excessively. Clearly my sinuses were full of salt water. I guess I had also breathed it in. Over the next several hours my nose continued to drain, but the good news is that my head felt better. I consumed straight water for the first little while to try to dilute the ocean water I drank, it seemed to be helping as the nausea subsided and I could tolerate some food. At least I knew with the higher humidity I would not need to drink as much I needed in the dry climate I was used to. My stomach didn’t feel normal so it was a challenge to make myself eat. I was going a slower pace than I had hoped for but I was managing the symptoms well and would rather not blow-up on the hills later. I tried to stay positive despite my slow swim start and concentrate on what I was doing at the moment. I was pleased to be passing people the entire ride despite not holding my numbers so I felt good about that. I was grateful the course was well marked but was still anxious to ride around other riders and the traffic. I found my legs seem to “lose all power” when I felt crowded or when a noisy vehicle zipped by. Honestly to be out on the roads in a crowded race was a win for me as I am still dealing with riding anxiety from being hit by a truck on my bike. It’s still a struggle but I was in California doing what I love to do. 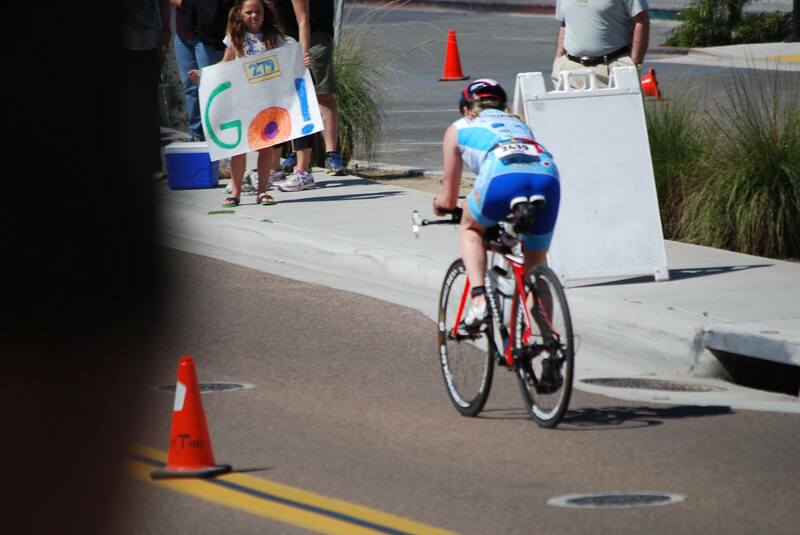 I love to train and race triathlons! As we approached the first major hill around mile 28/29 I was excited to do it. I have been training for hills and there are a lot of them where I live in Utah so I was pretty sure I could handle anything that was thrown at me even though I had only done a handful of outdoor rides since we were still seeing snow in Northern Utah. I tackled the hill well and passed many people. It was challenging, but I loved it. On the decent I tried to continue passing people and keep “pressure on the pedals”. I get a little nervous at the high speeds but tried to embrace it as I knew that I needed it to increase my average to finish in a decent time. Even though my stomach wasn’t feeling the best I tried to get some more food down as I knew how important that would be for the run. I didn’t end up eating as many calories as I had planned but did what my body would tolerate at the time so I felt it was the best I could do. I continued to try to ride strong but found it difficult to push myself. Just a few miles from the cycling finish while we were riding around a bumpy section behind some buildings a guy came ripping around the corner, cut me off, lost his water bottle and nearly took me out. I shouted’ “Hey man!” There is nothing like a close call to wake you up. I kept thinking, this isn’t the Olympics people! Obviously he took the 90 degree turn a little too fast. Either way I was glad when I rolled into transition unscathed and not having any mechanical issues. I was excited to run, it’s my favorite part! I chose to use regular laces for this race so it took me a bit of time to lace them up but soon I was on my way. The first mile went by fast and I felt good running close to goal pace. I had planned to hold a 7:45-7:55 minute per mile pacing which is very doable considering I ran a half marathon conservatively 4 weeks ago at 1:39. I had also been running strong in training. But through the next few miles I realized my stomach and guts were not going to cooperate with me. Although I was reluctant to stop I thought I had better make a pit-stop rather than have an “accident” and have chafing issues for a half-marathon. I felt better and worked my pace back up to goal pace for a short time, then realized I needed to hold back a bit more so maybe my guts would be okay. At this point my time goals were way out of reach and I just really wanted to go as strong as my guts allowed. By now I could start feeling some chafing under my arms which burned every arm swing. I hit the 10K in an okay split, much slower than planned, but still okay. I continued plugging along taking minimal nutrition as I didn’t want to upset my stomach further. 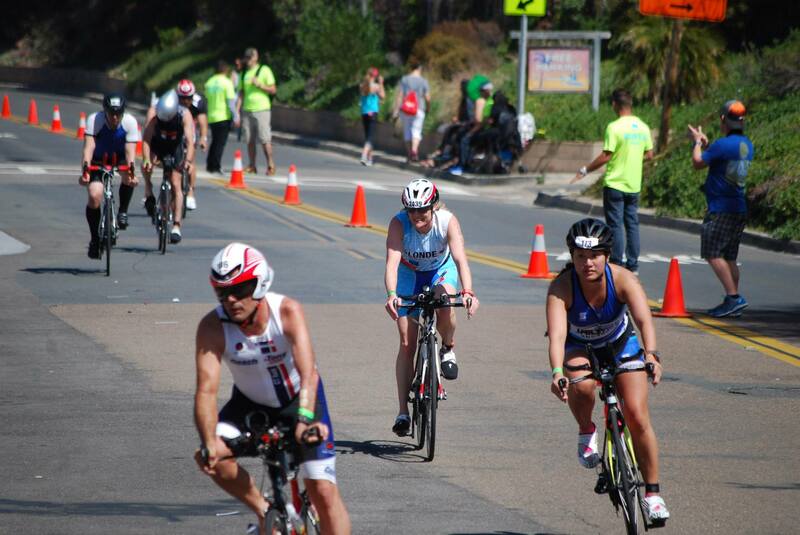 I took in the scene; all the people, we were running by ocean and I was doing an early season Half Ironman! This is not your every day event and I found myself looking for friends to cheer on despite my GI issues. I figured they could benefit from a wave and cheer and it served as a good distraction for me. I stayed positive. There are worse things that can happen. I had to stop and take many more bathroom breaks but I was determined to finish strong and not walk. I didn’t walk any of it, not even on the short steep sections. I wanted to have a few little victories in this race. I remember with a few miles to go my guts feeling the worst they had ever felt before in a race but I knew I could still finish and see my family so I pressed on. At this point there was so many people walking around me, but there was no way I was going to walk if I didn’t really have to. I wanted to reach that finish line as soon as I could! My legs felt strong but the jarring guts didn’t feel so good so I went as fast as I felt my guts would allow. I have never had this problem ever before on a training run or in a race (well, besides the time I raced a 10K in college with the flu or food poisoning, long story). Even though my race didn’t go as planned I was pleased to finish and have my family to share it with. It is disappointing to perform below my potential and not have anything to show for hard training effort, but even if others don’t know what I am capable of, I do. I ended up with a time of 5:53:48, and placed 33rd in my division, 177 female in and 912 overall and I believe we have around 2,600 athletes. So not terrific, but not horrible either. I believe many people in my situation may never have tried to do it, so I am pleased with that and will use the race as a learning experience. I am determined to learn how to combat my swimming and cycling anxieties and get better in tough situations. I am learning and will continue to try to reach my goals. 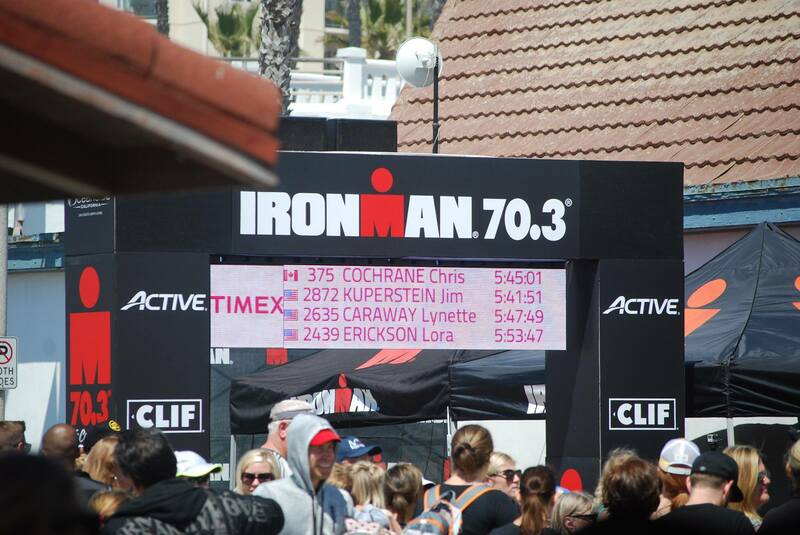 I have learned that I can still complete an Ironman 70.3 event after drinking half an ocean and having GI issues! Now that is an accomplishment! As always thank you to family, friends and sponsor support! You are greatly appreciated.